This was a piece inspired by the mythology of chaos versus order. 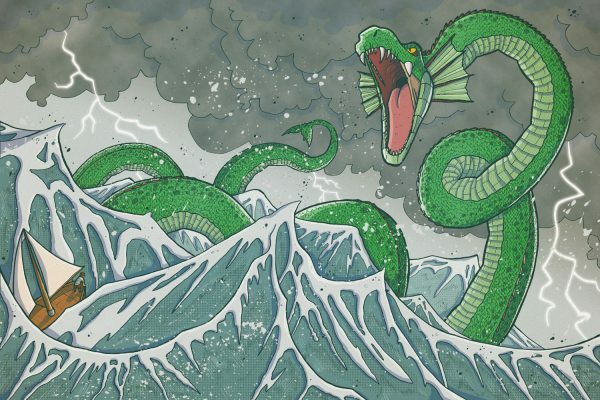 Perhaps as a result of our evolutionary history, the primordial reptilian predator remains a powerful symbol in many major religions, and the motif of the great flood or tempest is one that recurs across cultures. I wanted an image to represent each individual’s struggle against these forces of chaos, in as simple and archetypal a way as possible. The image was influenced in part by Hokusai’s famous “Great Wave off Kanagawa”. The rest was drawn from my own imagination.